On Saturday 5 February 1898 a private view at the Dutch Gallery in London introduced the guests to medals, plaques, seals, and some drawings, paintings and other objects at the First exhibition of the Society of Medallists. 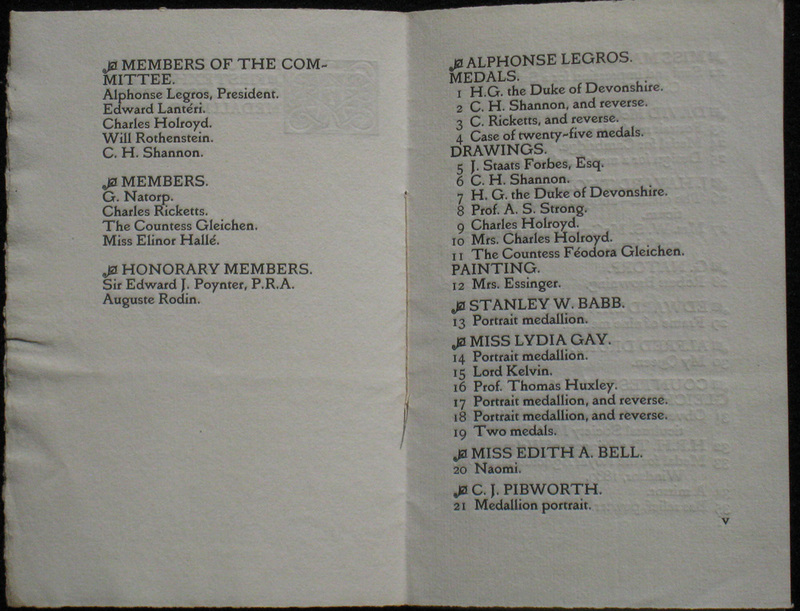 A catalogue was set in Ricketts's Vale type and printed on Vale Press paper by the Ballantyne Press for E.J. van Wisselingh's small gallery that, according to a later commentary in Literature, 'seldom fails to interest the visitor' (8 December 1900). The Dutch art dealer had opened a London shop in 1892 (it was to be closed in 1916), hoping to broaden the scope of his stock and to represent English and Scottish artists. He mounted three to four exhibitions a year at 14 Brook Street, which, however, were less successful than his shows in Amsterdam. He also introduced the work of Ricketts, Shannon, Rothenstein and others to the Dutch audience in the late nineties, but, although much effort was put into it, moving the exhibition from Amsterdam to The Hague and Rotterdam, sales were far from impressive. 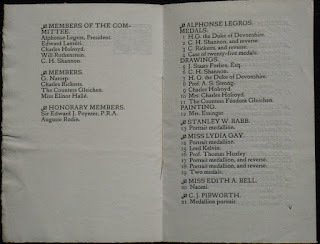 Ricketts was a member of the Society of Medallists, when Alphonse Legros was its president, and Charles Shannon a committee member. 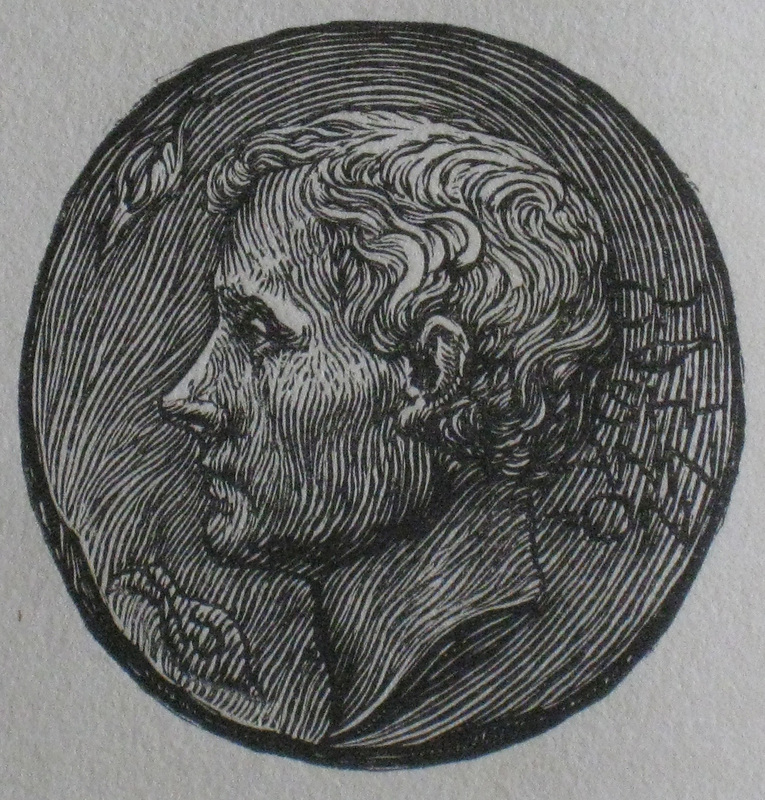 In 1897 Legros had made a medal with a portrait of Ricketts and an image of a woodcutter on the reverse. Legros had also made a portrait medal of Shannon, and these two medals, along with a medal of the Duke of Devonshire, 'were hung by themselves; twenty-five others inhabit one case', as the Pall Mall Gazette reported (7 February 1898). The same paper wrote about a portrait of Shannon, a pencil drawing by Legros, 'a most excellent likeness admirably modelled'. 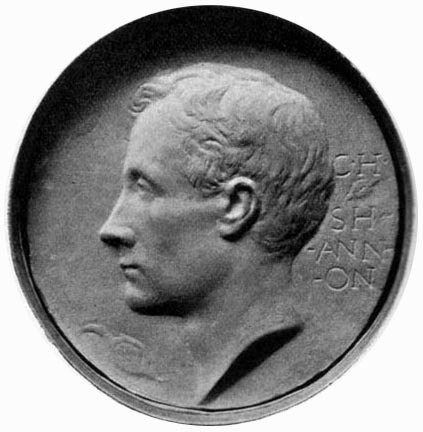 The portrait of Shannon on Legros' medal was appreciated by the sitter, but not that much by Ricketts, who thought it a little dull or quiet. Ricketts later reworked the portrait as a wood-engraved frontispiece for the Catalogue of Mr. Shannon's lithographs (1902). In Ricketts's version the lettering is cluttered, and the face looks less fair, a bit older, with the hair curling more lively and wild than in Legros' portrait. Shannon's face in Legros' version is more or less blank, while in his partner's case, the expression has a stern, or even disapproving, look. The mouth in the wood-engraving is different. The lips are opened, but as if Shannon is withholding comment. The eye, too, has a more tired look to it than in the sportsman-like version by Legros, as if Ricketts wanted to picture a man who has experienced life instead of studied it. It also seems that Legros saw Shannon as a somewhat prim English artist, and Ricketts preferred to see Shannon as a Roman emperor.